Since warmer weather is approaching, it's a good idea to focus on retention to maximize our increased hair growth rate. As I ran down the list of what best helps me retain, one of the first things that popped up was an effective pre-poo session. Consistent pre-shampoo treatments can really promote healthy hair. But does it matter what product we use? A few weeks back, I painstakingly applied conditioner to my dry hair, section by section. The process took so long that I decided to go to bed instead of completing the rest of my wash day session. "I'll wash this out in the morning," I thought to myself knowing what the outcome would be. The next morning, my hair was over saturated. I just knew that my hair strands expanded from all that exposure to a water based conditioner. In the end, I'm not sure my hair even benefited. That's when I decided to shift my strategy. Immediately, I went back to what worked. Instead of water based products, I would implement the greasy pre-poo treatment on wash days. Water based conditioners might be beneficial during the dry winters but now my hair is looking for something different. Greasy pre-poo products were made for the arduous detangling process. They give me a sense of confidence as I deal with stubborn tangles. I can almost guarantee less manipulation related breakage whenever I implement a greasy pre-poo. Not to mention that an overnight treatment with a greasy product has practically no negative consequence (other than a messy pillow if you're not careful). As a matter of fact, the moisture produced by the scalp over night mingles perfectly with the greasy pre-poo product for an even better result. 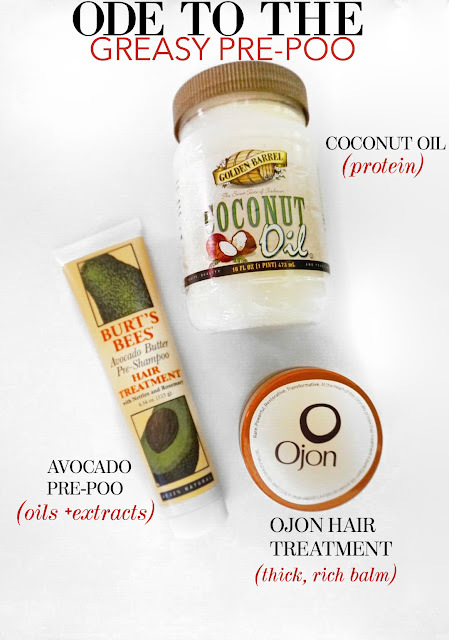 Three of my favorite greasy pre-shampoo treatments are coconut oil, Burt's Bees Avocado and Ojon's Restorative Hair Treatment. Coconut oil is my first choice whenever I'm experiencing uncomfortable levels of breakage. I try to leave it on long enough to know that my hair is absorbing the protein. Within a couple of coconut pre-poo sessions, my breakage is back in check. If breakage isn't an issue, then I'll opt for Burt's Bees or Ojon. Both have very different textures. Burt's Bees is a thick, heavy product kinda like a natural version of hair grease. I reach for Burt's Bees when I'm deeper in my stretch and I need something heavier to coat my hair. Although it's super thick, Burt's Bees pre-poo rinses out easily which makes an idea product for thick haired gals. Ojon, on the other hand, appears thick but melts like butter when you rub it in between your hands. The first time I tried this product, I didn't like it. That's because I used it during the winter. The balm retained it's thick consistency as I tried to apply it. But, instead of tossing it, I pulled the brown jar out of my product closet and decided to give it another try. This time, the product melted with ease between my hands. And my hair loved it! Ojon is a bit pricier because it claims to address damage in the hair. I recall seeing a noticeable difference in my hair every time I used it. They've recently changed the formula to deal with the pungent scent. Hopefully the product is still as effective. If not, I'll update my thoughts in another post. Spring/Summer, for me, means that I'll be relying heavily on the greasy pre-poo. When the pre-poo is done right, the rest of wash day just seems to go so well. I lose much less hair and, in the long run, this means better retention overall. prepooing with coconut oil or olaplex number 3 treatment before every shampoo has changed the game for me! love it <3 my hair loves me back for it. We use olive oil plus V05 conditioner with great results!